My first attempt at some loaves from my 'bourke street bakery' book. A bakery in Australia and their book was discussed in Shiao-Ping's blog posting. It's a beautiful book filled with lovely color photos and recipes from this Australian bakery. My first attempt at the 3 sourdough boule's and one large Apple and Oak battard, listed in the derivative breads chapter. 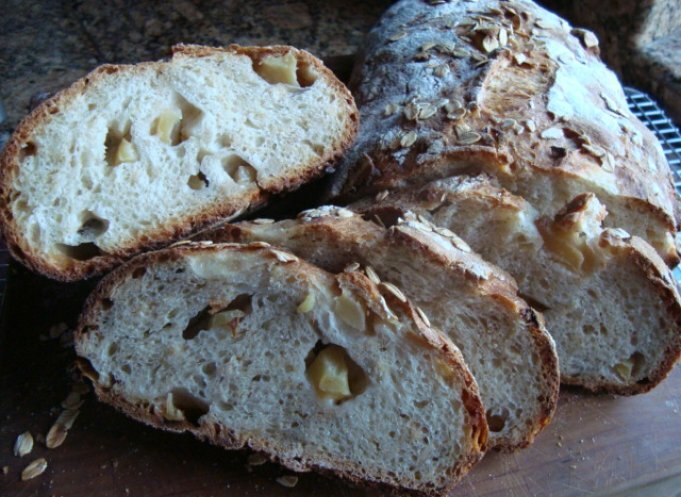 My husband was very happy with the flavor and crumb of the boule and I loved the Apple and Oat with cream cheese for a nice breakfast toast. Mix the dough in the afternoon and retard in the refrigerator through the night. 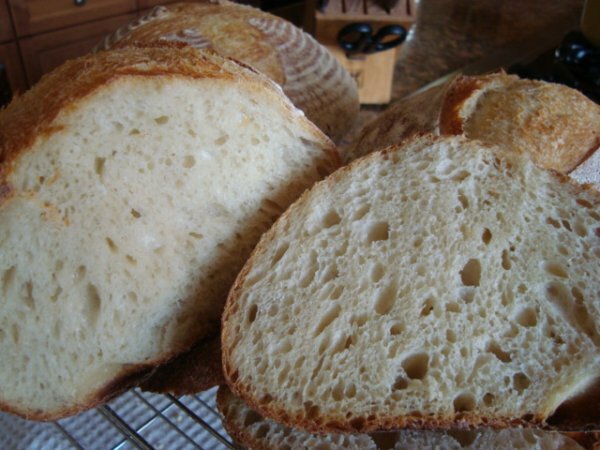 Placed the loaves in warm humid place for 1-4 hours and bake to have fresh bread for lunch/ in our case early dinner. Baked and steamed in a hot pre-heated oven on stones for 30minutes. Apple and Oat loaf - I experimented ' because we were going out for the evening and I had no time left for bread making' with this loaf by mixing and bulk retarding the dough and shaping the loaf the next morning before baking. All in all it turned out tasting very good. The stones were pre-heated at 500F before the temperature was reduced for steaming and baking. They were a little to hot for the loaves as the bottom was browned a bit dark. If you wish, you can play around with the ratio of oats to dough in this loaf and change its texture. Reducing the quantity of oats will mean it will not be as dense and can be cooked for a little less time. 40 ml (1 1/4 fl oz water) This water is to soak the oats in for about 5 minutes. Alternately, you can place the loaves on a baking tray lined with baking paper, seam side down. Place in the refrigerator loosely covered with a plastic bag for 8-12 hours. Baked on stones in a pre-heated steamed oven 450F reduced to 425F for 35 minutes for two loaves. I baked a little longer for the single battard. For not getting all the attention this recipe deserved it turned out pretty tasty. The apple bread looks particularly yummy. I can hear the crust crunch. I think it needs a thin slice of sharp cheddar. So, you just mix the oats with the dough? No soaking? Soaked oats kind of disappear in the crumb. I think I can see bits of oats in your crumb. Are they chewy, as I imagine? Thank you, David! I need to make note in the recipe above on the oats. The water is for the oats to have about a five minute soak. The recipe also stated. It is suggested to have this bread with a variety of cheeses for breakfast such as cottage cheese or ricotta or to serve it with a cheese plate as it has quite a subdued flavour and lets the cheese take all the tastebud glory. The oats gives this loaf a porridge-like texture, which becomes quite crumbly when toasted. Both those breads look great, just like from the book! And it's kind of funny, my copy of that book just came in and I just baked off the Potato bread junior yesterday, the apple and oats was on my list to do as well. I love potatoes and that is probably one of the prettiest boules pictured in the book. I think they piled on some extra roasted potatoes on top of their Potato Bread. Have you noticed how 'thick each of the pages are in the book' each page is thicker than a magazine cover! Gorgeous loaves, Sylvia! The ears on the sourdough look like a half peeled grapefruit. I also have the book but cannot decide which bread to try first. They all look so delicious. The boules came out nicely...but maybe you can tell me how they managed such hugh beautifully covered flourless birdseyes crusts? I would really like to improve on getting a birdseye crust like the ones they have pictured! No flour on the crust maybe they don't proof them overnight in a floured basket? If anyone could get a crust like that..I bet you could, Don! The apple oat loaf I'm sure would work much nicer not given the dough a bulk ferment overnight and then shaped, I had some beautiful sourdough peaked and we were going out..well I just didn't want to waste it and had some nice apples handy. I think I would pre-fer doing all the mixing by hand for the apple oat loaf and incorporate the apples differently next go round. I love using my new linen lined baskets, to bad they leave all that flour on the boules but they are so much easier than putting a towel in a bowl. Bread looks great. Quick question, I always thought recipes that use fruit should be the dried version. Is that true? Dried fruit has a wonderful more intensive sweet flavor IMHO. When baking fresh, think muffins with fresh blueberries or fruits. I also prefer using fresh cranberries in a lot my baking, I love the tartness with the sweetness...so it's no rules here..just maybe a personal preference as to how you think it will work in a bread recipe your using. Using the fresh apples, I picked a firm granny smith. I also love golden delicious apples for baking. Some are for baking and some are for just eating fresh. So many to choose. Google up apple varieties. I wouldn't use an apple that bakes up mushy. The fresh do tend to shrink in the crust..just like they do in a pie. I wondered about giving them a light saute before incorporating them gently into the dough. I think it would work nicely. It works when making an apple pie if you don't want the apples to shrink and leave the crust standing up with a hollow space between it and the apples. Very well done Sylvia! You certainly baked these in the spirit of the bakery. It is a great book for those wanting to make a bold statement with breads. I'm really enjoying it myself. The roasted potato is next for me. I would love to taste a loaf right from the bourke street bakery. The roasted potato boule they have pictured is one gorgeous looking loaf...I love all the herbs pictured in the mixer...mouth watering! I just purchased a new book all on roasted veggies...my favorite way to eat veggies! 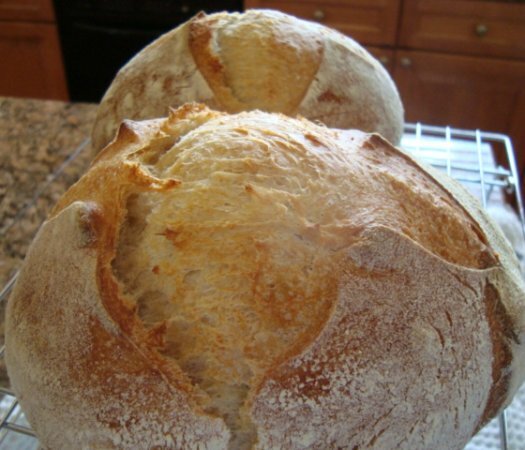 The oven spring on the sourdough boules is amazing! Boy, they look like they could just float away, and the apple and oat loaf looks delicious. I'm with David, a little nice cheddar and bliss. It toasted up great for a nice breakfast. Cheddar sounds good! I know cheddar and apple pie is supposed to taste great and yet I've never tried it..though I love a cheddar and pineapple combo for a salad.